Get all the information you need to save Lucis in Final Fantasy XV. Final Fantasy XV has been in development for ten years, but the wait is finally over. You'll follow Noctis and his faithful friends on a fateful journey, which goes from a lighthearted trip to a nearby country for a wedding to a epic adventure which will change the fate of the entire world. 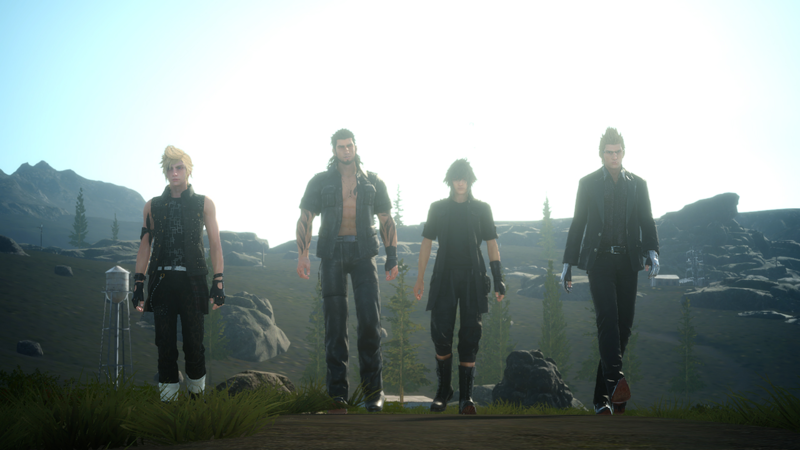 This article serves as a hub for all our Final Fantasy 15 content, here you'll find walkthroughs, tips, and other material that will help you make the most of your playthrough. Final Fantasy XV is the biggest installment in the series yet. With so much to do it's easy to miss something, but with our guides, you can stay on the right path and see everything Final Fantasy XV has to offer from beginning to end. This page breaks down content into specific categories to help you find the specific help you're looking for. To level up your characters, you have to sleep for the night. No matter how much EXP you rack up, your characters won't get any stronger until you find a place to rest their heads. Pay close attention to the time of day. At night auto-driving isn't available, and much more powerful enemies show up. However, some hunt targets only show up at night, so it's best to get a handle on the differences of gameplay in both day and night. Don't forget to use your AP. Unlike EXP, AP can be utilized as soon as you get it to unlock new abilities and boosts on the Ascension boards. Get the Analyze skill on the Ascension board as soon as possible. This will automatically scan most enemies at the start of battle so you can see their strengths and weaknesses. Otherwise, you have to put the combat into wait mode and use Libra. Always talk to the local restaurant clerks as soon as your arrive at an outpost. These "tipsters" will fill in points of interest on your map which makes navigation much easier. Once your car, the Regalia, is repaired, don't bother driving yourself around all the time. Letting Ignis automatically take you places allows you to enjoy the spectacular scenery and enjoy the interactions between your party members. Listen to some of the most beloved video game music in the iconic series' latest iteration. Learn how to use your rod and reel to catch juicy fish in Final Fantasy 15. Find out where to find Titan and how to make him give you his power. Follow this guide to gain the ability to ride your feathered friends! Want to win at Chocobo Racing? Follow this guide to give your Chocobo more stamina and make it faster. Use our guide to complete Noctis' set of Royal Arms and make your Armiger power unstoppable! Follow this guide, and you'll find all the items you need to make a better Drain Lance! Follow our guide to find Sturdy Helixhorns to complete the A Better Engine Blade III quest in Final Fantasy 15. You must have a minimum of 40.5 GB of free space on PlayStation 4 to install Final Fantasy XV. You must have 51.82 GB of free space on Xbox One to install Final Fantasy XV. This information will help you take down the hardest bosses in Final Fantasy XV. Using these guides will make sure you don't miss a single item, collectable, or side quest available in the game. Final Fantasy XV releases on November 29 on Xbox One and PlayStation 4.